Volunteers assist us in providing a variety of programs and services to meet the needs of the people of God through our Justice, Peace and Integrity of Creation (JPIC) ministry, our spirituality ministry (Tau Center), our Invitational Church ministry, and Liturgical ministry. Volunteers also assist in a variety of ways to meet needs at Our Lady of the Angels motherhouse. The truly meaningful rewards of volunteering are not always tangible. Each contribution, no matter how small it may seem, is blessing for us and for our world. The purpose of our volunteer process is to help you get to know the Wheaton Franciscans and our ministries, and for us to get to know you. Knowledge about your interests, skills and background will help make a better match between your volunteer interests and our current needs. As an Our Lady of the Angels Motherhouse volunteer you may assist with parking or help around the library. In the spring and summer, we also need volunteers to assist with gardening. 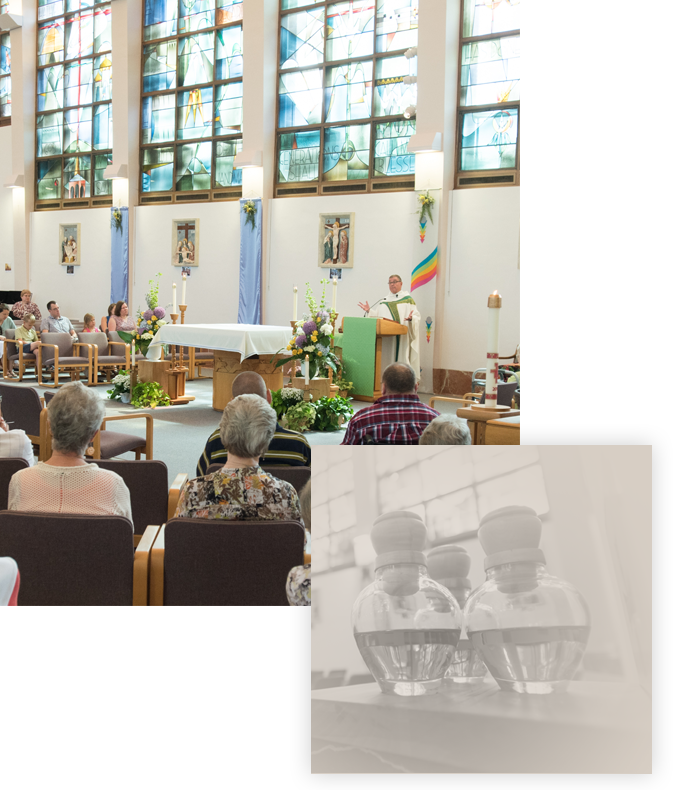 As a volunteer for Invitational Church you will assist with hosting the monthly Coffee &… once or twice a year; serving as a greeter for special events and/or prayer services; serving as a reader or candle lighter for Taizé; hosting refreshments following Taizé and other special prayer services. As a spirituality ministry of the Wheaton Franciscans, Tau Center volunteers are needed to help assist in setting up the ambiance and hospitality for the spirituality programs, along with helping on different office projects. As a volunteer for Prayer and Worship you will assist with art and environment decorating for the various seasons for the church year; musicians and Liturgical Ministers are needed during Sunday Liturgies and any office help assisting the Director of Liturgy. Experiencing the giving of ourselves in the service of others. Having a place to share talents and skills. Using free time in a meaningful way. Being with others who share a commitment to compassion and quality of service. Being with others who desire an environment of peace, hope, transformation, and healing. Building relationships with Sisters, staff, and with other volunteers. Learning about and sharing in the mission and ministry of the Wheaton Franciscans. It cannot be stressed strongly enough that any task that a volunteer participates in (whether answering phones, helping with a mailing, providing baked goods, assisting in organizing a special event, being a Eucharistic minister, or singing in the choir) is equally a contribution to the fulfillment of our mission. There are no insignificant tasks! Each contribution, no matter how small it may seem, is a contribution to an environment of peace, transformation, hope and healing.